If you live in the United States, you might think that your Internet is fast. After all, you now have access to movies and TV shows on demand, high quality streaming music, and websites that load instantaneously. There’s no way we don’t have the fastest Internet in the world, right? That’s where you’d be wrong. Really, really wrong. As an agency that relies on the Internet for every aspect of our work, we were curious to see how our speed compared to others around the world – and we were surprised by what we found. Check out this infographic to find out which countries have the fastest Internet speeds, how the US stacks up, and where you should move if you want the fastest download speeds (or the cheapest broadband!) in the world. At an average connection speed of 25.3 Megabits per second (Mbps), South Korea has the fastest Internet speed in the world. Tweet this stat! Notice the United States is missing from that list. So how does the U.S. stack up? 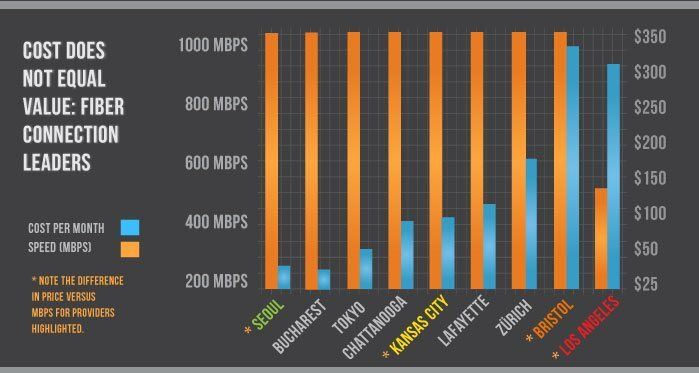 The average Internet connection speed in the United States is 11.5 Mbps, slower than Latvia, Singapore, and the Czech Republic. Tweet this stat! 11.5 Mbps isn’t enough to get the US in the top ten, but considering the worldwide Internet connection average just passed 4 Mbps, this isn’t bad. In fact, as you’ll see below, many states have average connection speeds higher than the national average, thanks to the increasing availability of faster options like Google Fiber and Verizon FiOS. Want the fastest Internet in the United States? Move to Delaware, where they enjoy an average connection of 17.4 Mbps. Tweet this stat! 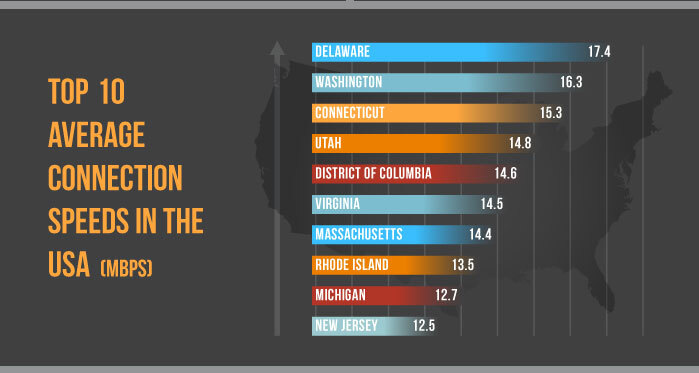 Delaware’s no South Korea, but speed tests show that its average Internet speeds are faster than the rest of the United States — and the rest of the world! In fact, the next state on the list, Washington, is even tied with Hong Kong for the second fastest Internet speeds on Earth. Additional speedy locations on this list include Connecticut, Utah, Washington, D.C., and Virginia. 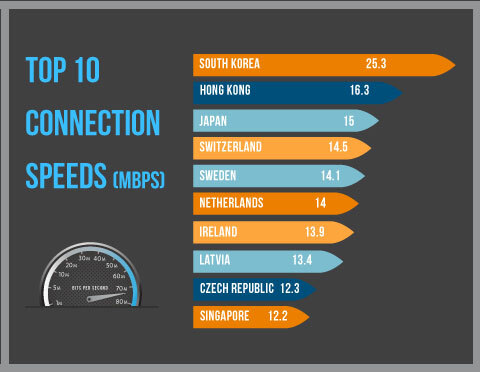 At an average connection speed of 18.2 Mbps, South Korea has the fastest mobile Internet speed in the world. Tweet this stat! South Korea’s mobile connections average 18.2 Mbps; the US average is only 5.8 Mbps. Okay, ouch. We’ve certainly come a long way from the days of reading emails on 2″ black and white Blackberry screens, but this is a pretty big contrast from what’s available in the rest of the world. Singapore’s mobile broadband speed clocks in at 9.1 Mbps, while South Korea enjoys a speedy 18.2 Mbps — higher than the United States’ non-mobile broadband average. Our mobile Internet may be fast — the 18th fastest worldwide — but compared to what is available in the far East, it might as well be dial-up! In the US, the average page load time on mobile is 4.44 seconds. In Vietnam, that load time is only 0.68 seconds! Tweet this stat! How long do you wait for pages to load on your desktop? How about on your phone? 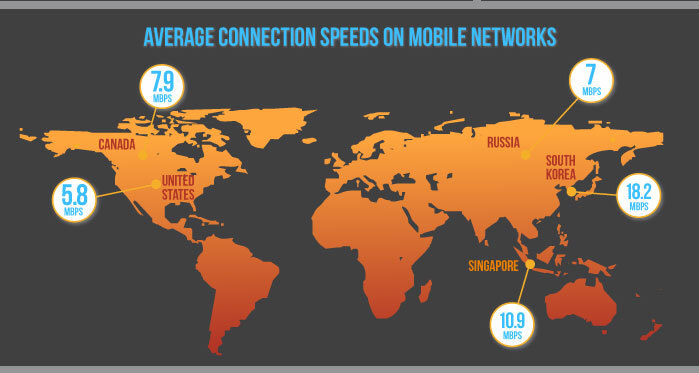 In the US, the average broadband load time is 2.82 seconds, while on mobile it’s about 4.44 seconds. In Japan, broadband users only have to wait 1.43 seconds for pages to load on broadband. 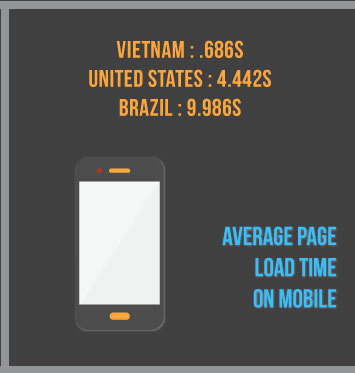 And in Vietnam, mobile pages come up in less than a second. Lucky ducks. On the other hand, Brazil gets the short end of the stick: it takes about 6.63 seconds for pages to load on broadband, and almost 10 seconds on mobile. Hellovision in Seoul, South Korea, and RCS & RDS in Bucharest, Romania offers the fastest and most inexpensive 1GBS fiber Internet at around $26-$32 per month. Tweet this stat! Along with the inexpensive and speedy gigabit Internet available in Romania and South Korea, Tokyo also has similar plans available for less than $50 USD per month. However, cost doesn’t always equal value: Verizon’s fiber Internet plan in Los Angeles costs around $300 per month, but the speed is only around 500 Mbps — that is, half of what is offered on other plans. And in Bristol, England, you can get gigabit Internet… but it’ll cost you over $300! Google Fiber, the Internet plan slowly being rolled out in cities across the United States, costs less than $100 per month for gigabit speeds. While the pace is slow, many cities are battling the telecom giants. As Google Fiber and new gigabit internet options spread throughout the country, Comcast and Verizon will have to come to terms with the competition. Curious to know just how fast your own Internet connection is? Run a speed test with Ookla here and you can find out in just a few seconds. How do your results compare to the national average? How about the fastest states? 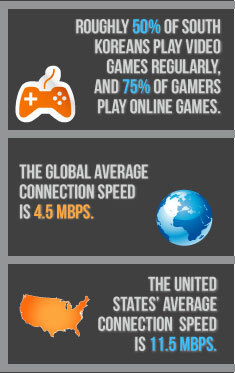 What about the fastest connections in the world? Do these results surprise you? Were you expecting the United States to have faster speeds? Let us know your thoughts, or share your own connection test results, in the comments below. We’d love to hear from you!